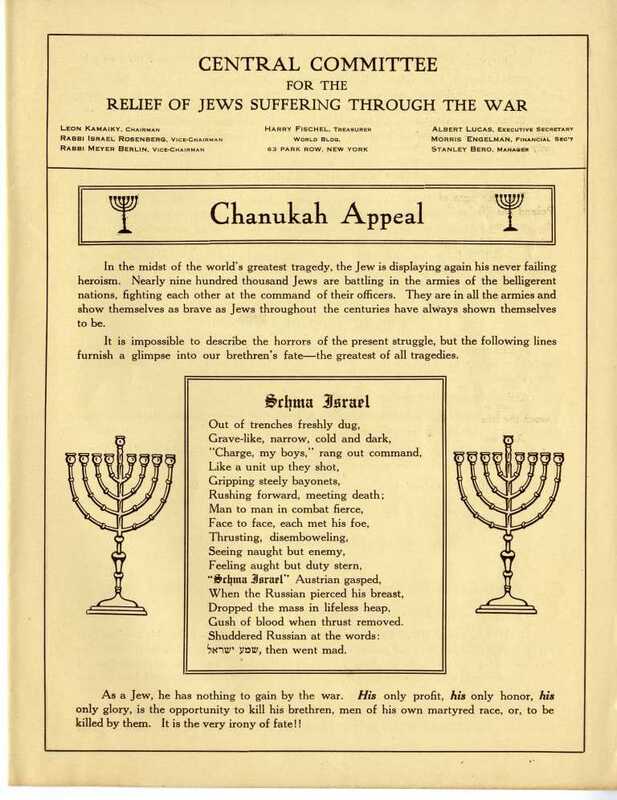 The Central Relief Committee (CRC) issued a combined Thanksgiving and Chanukah fundraising brochure in 1915. The CRC was founded by the Union of Orthodox Congregations of America on October 14, 1914, three months after the outbreak of the First World War, to provide aid to “Jews in Eastern Europe and the Holy Land” caught in the throes of the War. The organization’s motto was “Shed Tears for the Dead, But Give Bread for the Living.” Yeshiva University Archives houses the records of the CRC. 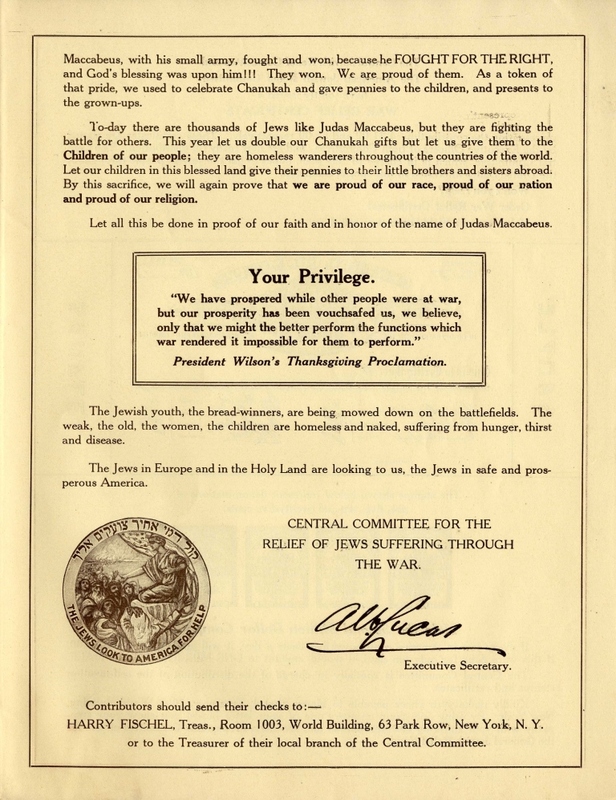 President Woodrow Wilson’s annual Thanksgiving proclamation in 1915, when the United States was still a neutral party in the conflict, stated: “another year of peace has been vouchsafed us; another year in which not only to take thought of our duty to ourselves and mankind but also to adjust ourselves to the many responsibilities thrust upon us by a war which has involved almost the whole of Europe.” The CRC creatively quoted an additional portion from Wilson’s Thanksgiving message in the fundraising brochure, highlighted in a rectangular box under the heading “Your Privilege,” a title supplied by the CRC to remind potential donors of the good fortune they have of living in America, and a way to introduce Wilson’s message: “’We have prospered while other people were at war, but our prosperity has been vouchsafed us, we believe, only that we might the better perform the functions which war rendered it impossible for them to perform.’” The CRC expanded the president’s message to apply to the Jewish situation: “The Jewish youth, the bread-winners, are being mowed down on the battlefields. The weak, the old, the women, the children are homeless and naked, suffering from hunger, thirst and disease.” Therefore “the Jews in Europe and in the Holy Land are looking to us, the Jews in safe and prosperous America,” for help in their time of need. The situation in 1915 was dire; the Jewish civilians in much of Europe “were crushed between the upper and nether millstones of the German and Russian armies.” Young Jews were “battling in the armies of the belligerent nations, fighting each other at the command of their officers” but they have “nothing to gain by the war.” The brochure includes a heart-rending story of a Russian soldier who kills an enemy Austrian soldier in hand-to-hand combat; the Austrian soldier calls out “Shma Yisrael” as he dies and the Russian soldier goes mad upon hearing the Austrian recite “Shma Yisrael,” and realizing he killed a fellow Jew. The Jewish community in the neutral ground of the United States steadfastly worked to raise money to help Jews overseas; one such effort, for example, was the visit of a CRC delegation to President Wilson at the White House to thank the president for proclaiming National Jewish Relief Day on January 27, 1916. 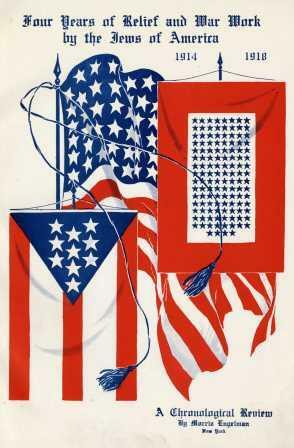 The United States entered the First World War on April 6, 1917, on the side of the Allies. 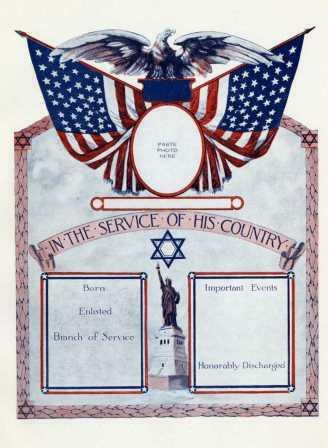 American Jewish soldiers now joined the US Armed forces and fought in the conflict. Thanks in part to American participation in the war, the Allies won. An armistice was declared and the First World War ended on November 11, 1918, in time for President Wilson to express the nation’s gratitude for peace in his Thanksgiving Proclamation of 1918. A sample Jewish congregational Thanksgiving service for 1918 is housed in the Yeshiva University Archives, in the papers of Rabbi Henry Morais. It includes a “Thanksgiving Prayer for the Armistice = Tefilah le-Todah” and a “Memorial Prayer = Hazkarat Neshamot” (in English and Hebrew) for members of the armed forces who lost their lives. The “Memorial Prayer” also remembers “all those who have laid down their lives as victims of the hunger, the suffering and the oppression brought upon them by war.” Facsimiles of these prayers are on view on the fourth floor of the Gottesman Library in the exhibit cases. Thanksgiving Day was on November 28 in 1918; it almost coincided with Chanukah which started that night, the evening of November 28. “Mooz [Maoz] Tsur” is on a list of suggestions for the Armistice Thanksgiving service, thus highlighting the Chanukah connection. A folk etymology for Chanukah is “Chanu Kof Heh,” “they rested on the twenty-fifth,” a reference to the end of the Maccabean war on the twenty-fifth of Kislev, the date of the first day of Chanukah. In November 1918, both the world at large and the Jewish people, who had all suffered unspeakable horrors, were able to rest from the travails of World War I.